Gibb's Farm is an authentic Anglo East African farmhouse offering a welcome retreat for the traveller on safari to Tanzania. Overlooking the centuries-old Great Rift Valley and Ngorongoro Forest, coffee fields and stunning East African vista before you, surrounded by terraced flower gardens and ancient trees – Gibbs Farm is a sanctuary for the senses. Experience the rhythm of a 50 year old working farm. Organic Arabica coffee is grown, processed and roasted on the farm. A 10-acre organic fruit, vegetable and herb garden, on-site dairy and bakery provide the wonderful ingredients for farm-to-table cuisine. Originally built in 1929, the historic farmhouse has been lovingly refurbished and offers a welcome refuge after a long day’s adventures on safari. The main farmhouse features a charming living room, two dining rooms, outside verandahs, a gazebo and gift boutique. Relax in one of the nooks and crannies with a cup of tea, enjoy the original artwork or experience tranquility as you recline on the spacious patio surrounded by lush, soothing gardens and sweeping views of the valley. 100% of grey-water is recycled. 90% of hot water is heated using solar power. 90% of the food served is grown on the farm. No harmful pesticides used, only natural fertilizer and compost. Dairy: Cows provide organic milk for farm guests. Meat: Cattle and pigs are fed farm kitchen and food waste, and feed grown on the farm or in nearby villages, supporting the local economy. The farm’s tree nursery (with predominantly native species) helps to control erosion and reforest the environment. Furniture, textiles and artwork are crafted on the farm by local carpenters, craftsmen and artists-in-residence. Eight gardens have been restored or established to attract bird and insect life including an english herb garden, cactus garden, flower garden (attracting over 200 species of birds), rose garden, medicine garden and ornamental flower garden (with almost 200 species). Cottages are very spacious, featuring a unique theme and richly appointed with eucalyptus floors and hand-crafted furniture. 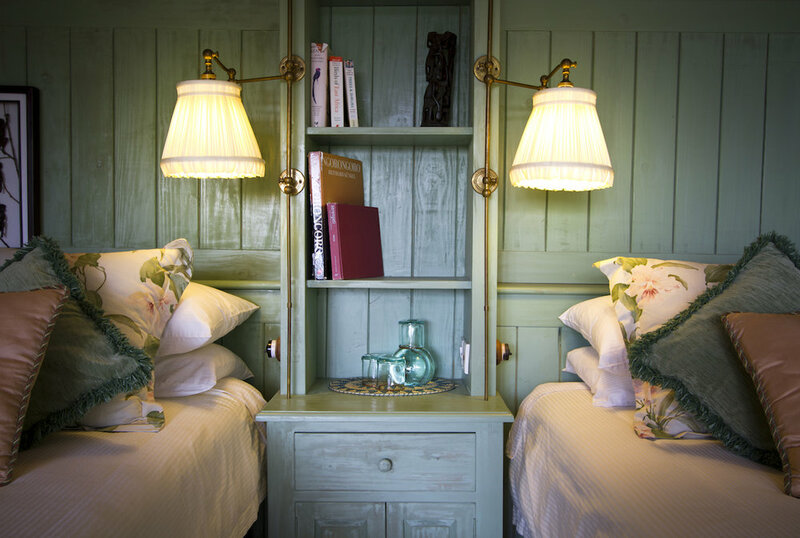 Each cottage features two queen-size beds, indoor and outdoor showers, bathtub, hairdryer, in-room safe, a fireplace, his and hers sink vanities and a private verandah. This property prizes itself on its eco-friendly initiatives including organic food, water ecology and various initiatives supporting the local communities. Gibb's Farm has been recognized by Conde Nast Traveller Readers Choice Awards as the Number 2 hotel in Africa. To allow you to fully experience the rhythms and beauty of the farm, community and nature, Gibb’s Farm offers a variety of activities, adventures and opportunities to rejuvenate. Whether you wish to relax and recharge, explore the diverse natural surroundings or learn more about the local culture and traditions, there are several experiences to choose from, many of which are free of charge. This is a great property to visit as part of a safari circuit any time of the year between June to March. April and May is considered the green season in Tanzania. The concept of this boutique lodge is truely one of a kind. 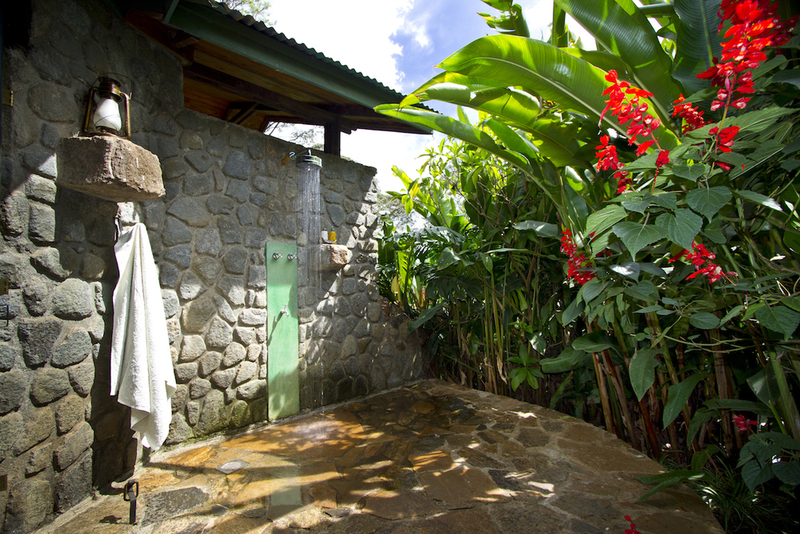 The lodge is located on a coffee estate and has a long history of over 50 years, starting out as a coffee plantation. Not only is the design very unique, the lodge offers warm Tanzanian hospitality. It is a true sanctuary for the senses and a great option for those looking to avoid the large lodges on the rim of the Ngorongoro Crater. Food quality: All vegetables and seasonal fresh fruits are grown in the 10 acre vegetable garden on the property. You can therefore be assured of the freshest food daily. Our guests love the variety, and high quality of food available at Gibb's Farm. The best thing is that it is all organic and goes straight from the farm to your fork. Start your day with organic Arabica coffee, grown and roasted right on the farm and a hearty farm breakfast. Mid-day, a farmhouse buffet offers a delectable array of foods to re-energize you, and in the afternoon, enjoy high tea in the garden with a delicious assortment of coffees, teas, fresh cream and scones. In the evening, candle-lit dinners feature English and Tanzanian-influenced cuisine and the opportunity to share the day’s experiences. Recommended length of stay: In order to be able to fully appreciate the lodge and take advantage of the various activities available, we recommend 2 - 3 nights. The rack rate ranges between $365 - $485 per person per night sharing in a double room including all meals. Prices vary depending on the month and season of travel. Lodges and camps structure their rates on a full board basis to include all meals. The reason being that meals are generally arranged at the accommodation venue. Picnic lunches are arranged for travel days and for days spent on safari game viewing. Room rates are always priced per person per night sharing in a double room. For further details including special rates for single rooms, triple rooms, child rates and any current specials that we have on offer, get in touch with us below. As a Destination Management Company and Tour Operator based in Tanzania, our team of safari planning experts have the local knowledge to be able to assist you in building a tailor made itinerary that includes this particular accommodation as part of you Tanzania safari holiday.